Directions: Once you enter Death Valley, you will need to pay for a visitor pass at either Furnace Creek Visitor Center, Scotty's Castle, Stovepipe Wells, or one of the automated fee machines. From Stovepipe Wells, head west on Route 190 for a few hundred feet until you reach a sign for the Mosaic Canyons. The parking lot is 2 miles down on a gravel road. What to bring: The Ten Essentials and lots of extra water! 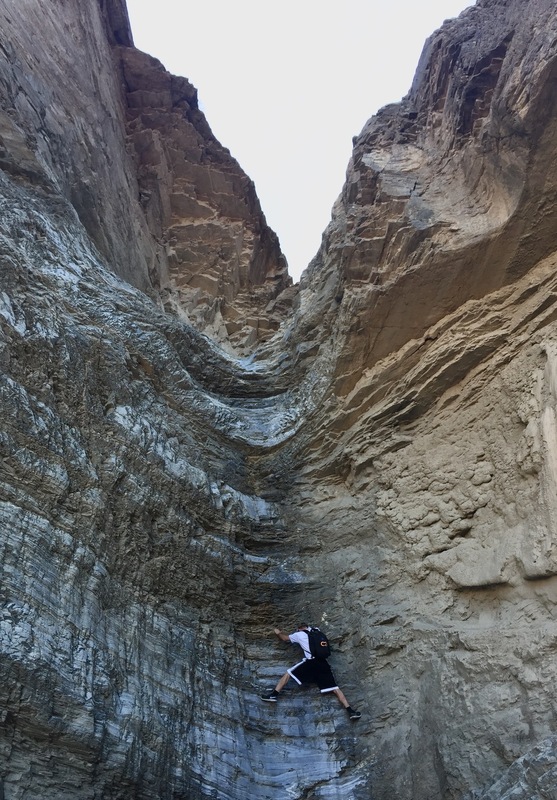 At the parking lot for Mosaic Canyon, head down to the narrowest section of the canyon. This stretch is about a 1/2 mile. From there, the narrows open up to a beautiful, vast wash. There are 2 or 3 clearly marked trail options here. It doesn't matter which one you take, but we chose to go above the wash in an attempt to find bighorn sheep. There are some cairns here to help you, but they really aren't necessary. I understand that the park rangers are discouraging hikers to place cairns because it's nearly impossible to get lost with the canyons leading the way. After about 1.5 miles in, you reach what looks like a road block. Boulders have covered the trail, and sadly a lot of hikers turned around here. Don't be discouraged! If you look to the left of the boulders, you will see a nice footpath over some rocks and around the bend. We guided a few hikers to this footpath. From here, the canyons really shot up. The light was perfect at around 11AM. It made the hike really enjoyable, and I was happy to have some shade from the canyon walls. About 0.7 miles after the boulder road block, you will hit the final wall. Unless you can make it up this slab, your journey is over. Time to turn around and head back the way you came.